Do you know Mark Baker? Maybe you know him as U2 BROTHR? How about that guy at the U2 show in the GA line and on the front rail at the stage in the mirrorball hardhat wearing his ‘U2BROTHR’ license plate? Yes, that’s Mark Barker, aka U2BROTHR, aka Mirroball Man (at least that’s what I used to call him). I am not exactly sure when I first met Mark. I don’t remember him on the ZooTv or Popmart tours, but I remember seeing him at various shows on the Elevation and Vertigo tours. It wasn’t until the 360 tour that I actually spoke with and became friends with U2 BROTHR. Probably because like Mark, I was also wearing the same attire to each U2 show (my Larry Mullen Band shirt and straw cowboy hat). You know, us crazies have to stick together. Mark is the greatest guy and a true U2 fan. He was genuinely happy for me when Larry hugged me on his way to the stage at the final US 360 show in Pittsburgh. After the 360 tour ended, Mark told me he was doing a documentary about his U2 fandom. Two years later, U2 BROTHR was finally released – and it is fantastic! It is a must-see for any U2 fan and for friends and family of U2 fans so they can understand our love (and craziness) for U2. With U2BROTHR, Michael Corbiere accurately captures exactly how U2 fans are: making decisions whether or not to go to the next show, GA line procedures, stressing over what to say to Bono (or Larry) when we meet him, deciding on what ‘spot’ to get once inside the venue and how we are portrayed by non-U2 fans (our family and friends). I have never seen anything that portrays a U2 fan’s concert experience just as it exactly is. U2BROTHR is perfect! An amazing job by Michael Corbiere and Mark Baker (and everyone else who was involved)! So why hasn’t anyone made a documentary about me? 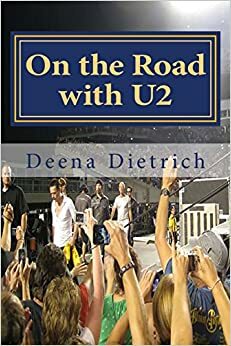 (she writes half jokingly) I have been to 75 U2 shows, including the three-month road trip on the 360 tour in 2011 driving with my two dogs to every show in the US. I’ve met Bono countless times, six specific times that I can clearly remember the conversations. And I also have a U2 shrine in my basement. If anyone would like to make a documentary about me on my quest to meet Larry Mullen, please let me know. (haha) Until then you can read about it in my book On the Road with U2: my musical journey. For all your U2 news, follow me on Twitter @OnTheRoadWithU2.